I’m tired of waiting for the weather in Texas to cooperate and have it be cool enough to declare the start of soup season. I don’t care that it is still in the 80’s most days. It’s November for goodness sakes! 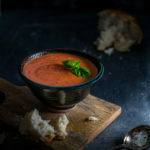 I’ve waited patiently to post soup and stew recipes so I’m kicking off soup season here regardless of the weather with this tomato-basil soup – it’s rich and comforting and comes together quickly with items you can easily keep on hand. There are a few key points in getting as much flavor as possible out of the short simmering time. First, use canned whole tomatoes. I know it seems counter-productive to start with whole tomatoes only to crush them yourself. However, I have tried this recipe with both canned crushed tomatoes and diced tomatoes and found that the tomato flavor just wasn’t as deep as when I started with whole tomatoes. To easily crush the tomatoes without making too much of a mess, I recommend using a potato masher. If you don’t have one, just wear an apron and use your hands to crush the tomatoes (the apron is just to prevent your favorite shirt from getting some new Jackson Pollock inspired tomato juice stains). My other recommendation is to use fire-roasted tomatoes. When you can’t roast the tomatoes yourself, canned fire-roasted tomatoes are the next best thing. The original recipe for this tomato soup comes from La Madeleine restaurant where the tomato-basil soup is one of their most popular items. But would you believe the original recipe calls for 4 times the amount of whipping cream and butter I have listed below? The nice thing about making the soup at home is you can control how indulgent you want to be. Though the full fat version is good, it’s still hard to justify. So I have listed the recipe as I make it which I feel has just enough creaminess to be satisfying without having to feel guilty about it. Not to mention, I want to save those extra calories so I can indulge in the inevitable grilled cheese sandwich that must accompany this soup. And if the sandwich happens to be made with this bread – all the better. In a large saucepan, crush the tomatoes using a potato masher or your hands. Stir in tomato juice and vegetable stock. Simmer soup over medium-low heat for 30 minutes. Let cool slightly. Purée soup, along with the basil leaves, in small batches, in a blender or food processor or add basil leaves to the saucepan and purée soup with an immersion blender. Return soup to saucepan (if you used a blender or food processor) and stir in cream and butter. Cook soup over low heat until cream and butter are incorporated. Season to taste with salt and pepper. Garnish with basil leaves and serve with your favorite warm bread. Recipe adapted from La Madeleine restaurant via the Houston Chronicle. “I’m tired of waiting for the weather in Texas to cooperate and have it be cool enough to declare the start of soup season.” Here, here! I’ve been wearing sweaters all week because it is fall, dangit, even if I have to run the fan on my desk at work…. Anyway, I never thought of using canned fire roasted tomatoes to make soup. Going to have to give this one a try — I used to love the Le Madeleine tomato soup & bought it from HEB all the time, but eventually gave it up because (1) too many calories and (2) too many $$$. This looks like a great alternative. I’m totally with you – boots and sweaters all the way! I hope you enjoy the soup. Feel free to add more/less of the cream or butter depending on your mood and please come back and let me know how the recipes works out for you. Thanks. Beautiful photos! I know what you mean by the difference in flavor between chopped and whole canned tomatoes – it had taken me a good while to figure that out. Thanks! I think the shot with my hands took about 50 tries before I got one without my hands looking weird. I hope you get to try the soup. It really is tasty.